PROPERTY DETAILS Coorg Life is a beautiful property offering a complimentary breakfast to its patrons. The property in Madikeri is a three bedroom independent property that is equipped with essential requisites. 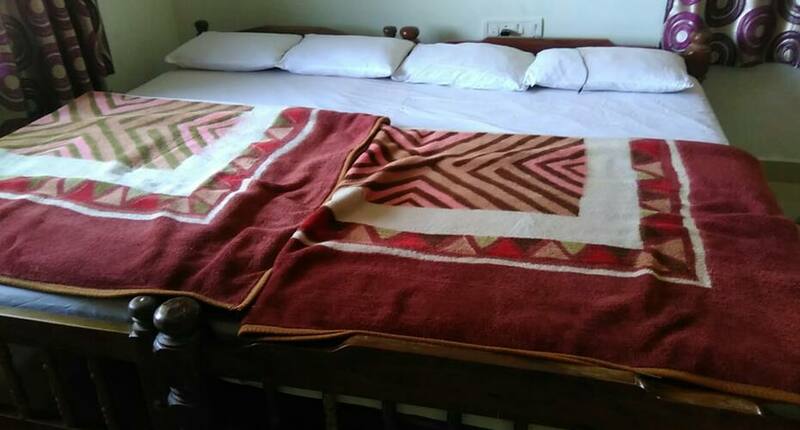 Conveniences available in the rooms include drinking water, television, side table, teapot, ceiling fan, large bed, attached bathroom, and hot water supply. Guests are offered pick-up/drop service, travel assistance, medical aid and housekeeping during their stay. Other facilities include car parking, kitchen, and garden with sit-outs. NEIGHBOURHOOD Places worth visiting include Raja Seat Mantapa (1 km), Madikeri Fort (1 km), Abbi Falls (7 km) and Omkareshwara Temple (2 km). NEARBY Kannur International Airport is 91 km away, while Kaniyoor Railway Station is at a distance of 76 km from the property. KSRTC Bus Station is 74 km away from the property. Taxi and Rickshaw are available and connect well within the city. HOUSE RULES TIMINGS: 12-noon Check-in and Check-out, non-veg food is allowed, smoking is allowed, drinking alcohol is allowed, unmarried couples are allowed, valid ID proof is a mandate, and pets are not allowed.